BlueCamroo already has in-depth Time-related functionality so adding Resource Management felt like a natural fit. For Project Managers, it is very important to see, both quickly and also with great detail, their Team Members’ available Time. Also, as workflow increases, and Projects get more complex, being able to view and manage the Time of your Team Members becomes even more important. With Resource Management in BlueCamroo, you can see what Users have been spending their Time on, as well as their availability in the future. You can see individual User’s Time usage and availability on a daily, weekly, and monthly-basis. If their Team Members are consistently being overloaded or under-utilized. How well a User sticks to Deadlines and Budgets. When and why someone had to work over Time. Who is available to take on new Tasks. See how a Task is Progressing using both planned Work Effort in hours as well as % Task completion. How specific User Groups are performing. BlueCamroo Users with the proper permissions are given the ability to reschedule, re-assign, and cancel Tasks directly from each individual User’s weekly Time Utilization page, and even view other User’s availability when creating new Tasks. This makes it easy for Managers to make any adjustments they need to make on the spot while cycling through their Team Members availability. Managing your Team Members’ time is dependent on their available time, which is typically constricted to their work hours. By default, work hours are set up as Monday to Friday, 9:00 AM to 5:00 PM, however, more and more people have offset hours or work remotely. For each worker BlueCamroo allows you to set their work hours. Even though you may have set work hours for your company already, each individual User may have unique circumstances which alter their work hours. In this context, Utilization is the window of Time that the User can reliably dedicate to working on Tasks. It is common practice for companies to give their employees some amount of ‘slack’ Time, which can be used on non-task-related work, such as work emails, calls, lunch, breaks, etc. It is necessary to adjust each individual User for this ‘slack’. Not doing so will likely result in inaccurately displaying of your employees available work Time, meaning they could be overloaded and unable to finish their required Tasks on Time. The Monthly Task Summary is a report aimed at giving you an overview of the selected Users performance with Tasks for the month. 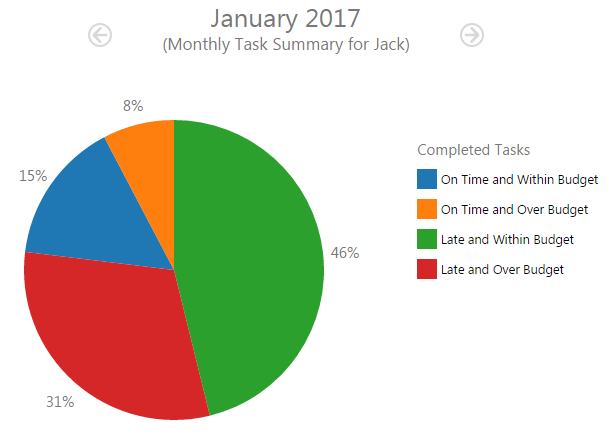 On this page, you will find a Pie chart which represents the Users performance on completed Tasks for the month in relation to how well they were able to stay within budget and on Time. The Pie is divided into 4 segments, seen below. As a Project Manager, the most valuable resource available to you is your Teams Time. 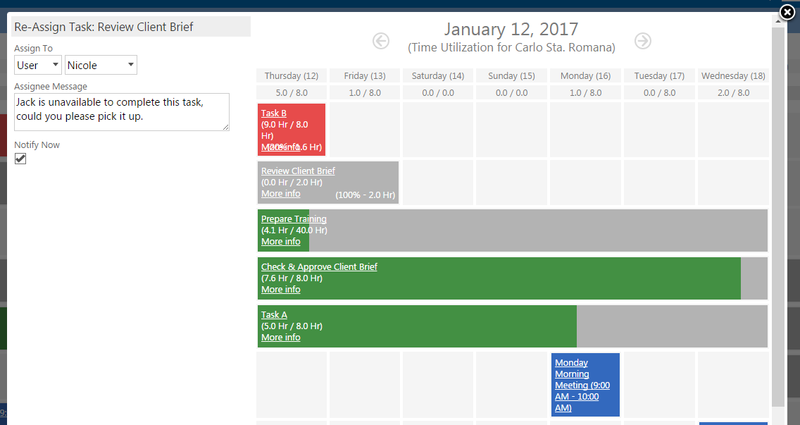 The Weekly Time Utilization view makes it easy for you to see even more details of your teams Time Utilization, as well as give you the ability to easily Reschedule, Re-Assign, or Cancel Tasks if necessary. 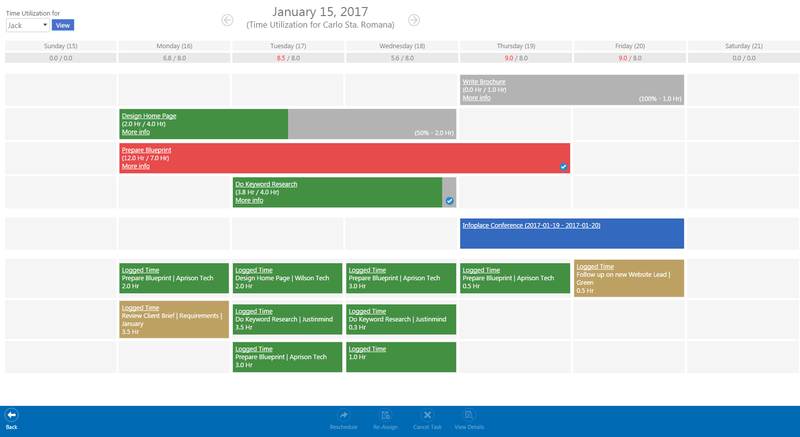 In this calendar-like view, you will see an in-depth representation of the Users available Time, as well as the scheduled and completed Tasks, Events, and Time that the user has logged throughout the selected week. The Bars representing these items are colored differently depending on their status or details.